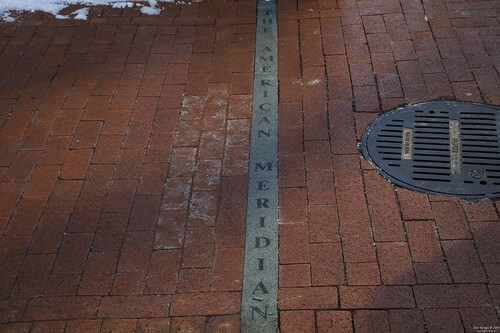 But why have an American Meridian when Greenwich’s would do? The only good way to measure longitude was to take a clock, synchronized from Greenwich’s observatory master clock, and sail it across the Atlantic. Sure, that sounds pretty straight forward, but clocks, even as late as the early 19th century were not anything we’d considerate accurate to the second, not to mention had all kinds of mechanical issues even if you sailed them across the sea. Not to mention the fact that two journeys could come up with two totally different longitudes for the final result. Thus, setting a local point of demarcation allowed for a better continuity of result. Three reminders remain here in DC of this peculiar historio-technical dispute: Meridian Hill Park on 16th Street in DC is named for the Stone Obelisk that was erected here along the original prime meridian in 1804. While the stone itself is long since gone, 16th Street remains the original American Meridian, and the park named thereafter remains. 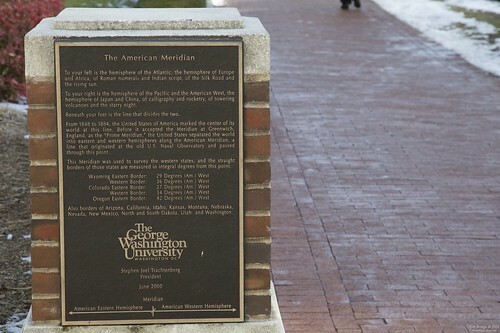 The Meridian monument pictured above is at the corner of 24th and H Street NW on the campus of George Washington University. The line there depicted with engraved stone is along the line through the Old Naval Observatory, and was the line of demarcation for the creation of the borders of several states. The third artifact of the pre-Greenwich age is the “Zero milestone” which sits on the original White House meridian on the Northern Side of the Ellipse and was to have been the Zero Milemarker for all American Highways. The interesting thing about all of this geographical confusion is that the borders of several states (including any with a straight north-south line created or altered after 1850 and before 1912, when the American Meridian was formally dismissed by act of Congress.) were determined by the American Meridian at Washington, as the only group to seriously use the standard instead of the Meridian at Greenwich were surveyors. Oregon would be the first to truly use the American Meridian in 1859 when it became a state. The southeastern border of the new state would be 42 Degrees West of the American Meridian. Colorado Territory in 1861 would be next to use the Meridian, establishing it’s eastern (27°W, Am) and western (34°W, Am) borders with the meridian. I’ll leave to the reader the task of figuring out why perhaps the American Meridian never took off at sea, and posit that a quick look into Actor Network Theory might prove interesting. So, when you say to your out of town friends and family that this really is the center of everything, take them over to GW and show them the meridian, and point out that was once legally true. While the monument itself is a bit over-the-top, talking about the two hemispheres, Atlantic and American, it’s still nice to know that we still keep witness to it. Many thanks to Geographical Review (login required), DCist, Wikipedia, and the Library of Congress for helping source this article. Whoa, i am a huge fan of longitude and all that it enatails and provides (seriously). I have to run to meet some guys for lunch, then go to the cigar shop and smoke a hoya, and then watch the honda classic on tv, before I have to go to HH. I have a very busy afternoon. So, I will post again tonight on this subject. All these years later, time and longitude are still intertwined. A GPS receiver is by design, definition, and necessity an extremely accurate clock. If you have a working GPS receiver, you not only know exactly where you are, you know exactly when you are too. This is a great post. I watched the show Longitude on PBS and that got me to read Dava Sobel’s book of the same name. I have always been fascinated, amazed, and awed by explorers who would travel only knowing east and west. Navigation wihout longitude and the use of stars etc is still is a source of wonder for me. I need the GPS to go the grocery store.